Students - When I first pointed to PRESCRIBE, my first thought was to write using all -SCRIBE words. SCRIBE means 'write,' and I thought it would be interesting to write a poem using the words PRESCRIBE, DESCRIBE, SUBSCRIBE, INSCRIBE.... 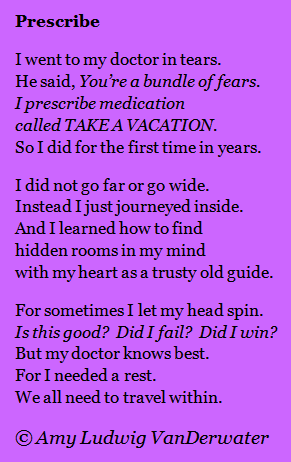 But I changed my mind when I realized that MEDICATION and VACATION are pretty neat rhymes. Those two words made me write this whole silly poem. Today's verse is a limerick. It's actually three limericks. I'd only planned to write one, but the story wanted to go longer, so I wrote longer. (Sometimes you just have to listen to the story!) Limericks require a lot of tapping on the table to see if they sound right, and because of this, our table might have a little headache right now. I have not written many limericks before, but whenever I do, I begin thinking in that form. Can you imagine meeting a person who always spoke in limericks? In case you are new to The Poem Farm, this month I am walking, letter-by-letter, through the dictionary, (closed-eyed) pointing to a letter each day, and writing from it. You can read poems A-P by checking the sidebar, and you visit Lisa Vihos and read her accompanying daily haiku at Lisa's Poem of the Week. I'm so happy to share that for the past two days, we have also had Christophe sharing haiku in the comments of each post. Go back to N is for NORTHERN IRELAND and O is for OVER to catch up on the latest haiku! You may also be interested to know that I have categorized 250 poems by both topic and technique - see the top tabs. 250 to go. If you have not yet taken a peek into Laura Shovan's notebook to see the evolution of her poem, April, please go and read her post at my other blog, Sharing Our Notebooks. There is a giveaway on that post for her beautiful chapbook, MOUNTAIN, LOG, SALT, AND STONE. Names will be drawn before Friday! Tomorrow I am pleased that I will host the 2012 Kidlitosphere Progressive Poem! It's just like a dinner, but everyone contributes a line instead of a dish! If you would like to read the poem so far, see today's post with Tara at A Teaching Life. for writer's block. Should I wait? No! Write now, right now! Nice job on the triplimerick. Limericks are a fun form and one of the first I learned when I was about 10 years old. Still one of my favorites. Before I “scribe” (write?). I think. I prefer that my Haiku have a seasonal "hook." This one does not and seems a bit cold because of that. 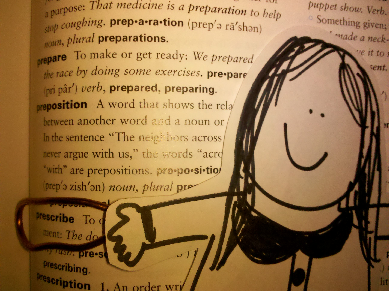 Amy, this is my favorite dictionary poem so far. I love the idea of taking an inner vacation. "I learned how to find/hidden rooms in my mind" -- so true, but we all need a reminder to visit those hidden rooms once in a while. Bravo! We all need to take these these Fake-ations!! I enjoyed your poem today. I enjoyed it in so many ways. So it is here that I visit and stay. I think I will print & post this where I can see it every day, Amy. We all need an inner vacation each day-at least once! And congratulations on all your organization work. It will really be helpful for everyone, including teachers. Can't wait to see what you do with the poem. It's getting really interesting! Wow! Two PRESCRIBE poems about writing. What fun! Makes me want to go back and do another limerick about writing. Maybe Cathy will! Thank you so much, Cathy and Linda and Laura and Christophe and Lisa, for joining me today. Such neat people I know! a.